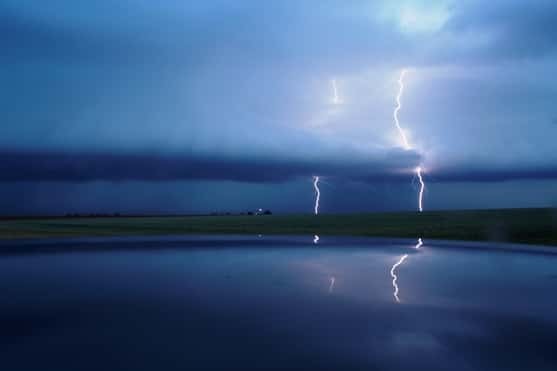 The National Weather Service says strong to severe storms will be possible in the Ozarks Friday night. 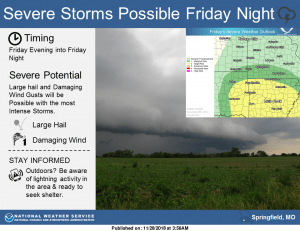 Forecasters say it remains to be seen if we’ll have enough instability for storms to become organized, and it looks like the greatest threat for severe weather will be south of Springfield, where a “marginal risk” exists. Northern Arkansas is under a “slight risk,” with even better chances of storms producing damaging winds and hail. Forecasters say the window for thunderstorms will be short-lived, with conditions becoming dry by Saturday morning. Cooler air then arrives by Sunday, with afternoon highs in the 40’s. Stay up to date with the latest watches and warnings and track interactive radar at KTTS.com.